"Welcome to this evening's Prom at Lincoln Drill Hall"
Never in a million years did I imagine ever saying those words, yet on the evening of 4 August 2018, I did to a full house. But why Lincoln Drill Hall? Introducing the broadcast afternoon performance, BBC Proms Director, David Pickard, explained that it came about through serendipity. The whole Proms season was commemorating the centenary of the end of WW1, David had always wanted to perform the Stravinsky's The Soldiers Tale and, following Hull last year, wanted to find a venue outside London. 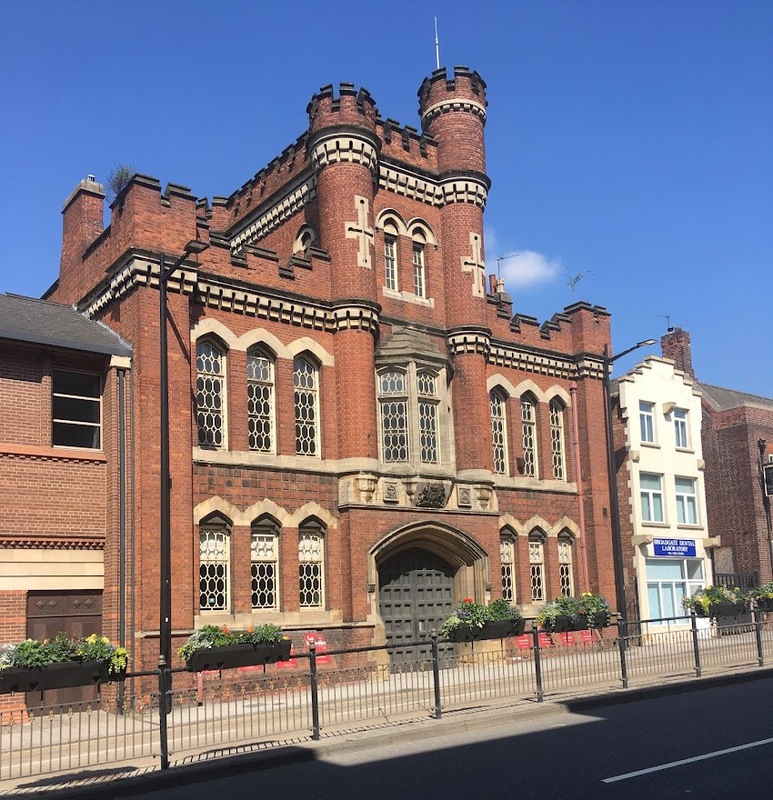 Lincoln Drill Hall fitted the bill perfectly as a well regarded arts centre with a flexible performance space and with a strong military history. Petroc Trelawny, introducing the piece, explained that Stravinsky had collaborated with CF Ramuz to produce The Soldier's Tale inspired by Russian folk tales telling of a runaway soldier who sells his violin to the devil in exchange for a book that can predict his future. Scored for a trio of actors and seven musicians, the Hebrides Ensemble with Daisy Marwood, Laurence Guntert and Tom Dawze, enchanted the audience with stage direction by James Bonas and choreography by Cydney Uffindell-Phillips. It was the 4th Battalion of the Lincolnshire Regiment for whom the Drill Hall was home. They were territorials, young men from a whole variety of walks of life, who came here to be available to serve King and Country. This Hall saw them drill, it saw them muster, it saw some return wounded. In late July 1914 they were at their annual camp in Bridlington. It was there that the order came for them to return to the Drill Hall. They arrived on the morning of 4 August 1914 but were then sent home to await orders. We would love it if you could join us at Lincoln Drill Hall on Sunday 8 July at 7pm at the launch of an exhibition of work by Lincolnshire makers interpreting what one hundred years of some women getting the vote means to them. We will be joined by performance poet Gemma Baker. I do hope you will be able to come. You are invited to join us for lunch (soup of course!) and hear pitches from local people with big ideas for making a difference in our community. The formula is simple: 5 x 5 x 5 - Buy a £5 ticket - Hear pitches of no-more than 5 minutes in length - Dig a bit deeper with 5 questions from the audience. Once all the pitches have been made, lunch will be served and audience members can discuss the ideas they’ve heard - which one will make the most impact? which is the most exciting? which do we want to support the most? Then we vote! The winning pitch will receive all the ticket money from today’s event to turn their idea into a reality. “When local people invest in the enthusiasm of others, making a positive difference becomes so much easier.” - Steve Kemp, CompassionateLincoln. The Big Soup will be held at Lincoln Drill Hall on 16 June. If you would like to come along and vote, follow this link to tickets. The Windrush generation, people with disabilities seeking benefits - actually anyone seeking benefits, people seeking asylum - they are all being met by an atmosphere heavy with nastiness. Women going back to work part time after maternity leave find themselves discriminated against, often being required to do a full time job in their four days - or else nastiness. People without homes having no option but to sleep on the streets, or else nastiness. Where has this come from? Weren't we once a nation of warm hearted people? Perhaps that is remembered through rose tinted spectacles, but surely something has changed. If we look at each of the examples I have cited, they all have in common one base cause - the need to save money. Governments have gone to the electorate vowing to contain public expenditure, to save money. Ministers have instructed their senior civil servants, who in turn have passed the instruction down the line, each with underlying threats of nastiness. It is a massive abuse of power of a kind that Magna Carta has being fighting against for 800 years. Saving money is essentially a negative activity and this negativity has seeped through to all parts of our society. Older members of the indigenous population complain that their street or town is not what it was; there are now voices speaking different languages, skins of different colours - note: never people. They have cried out to politicians who have rushed to their aid with promises of reduced numbers. How do you reduce numbers, but by setting targets expressed in numbers - it's obvious. Nastiness then follows as the targets crack the whip. Some politicians reach for a simple solution: tax the rich, tax the evil corporations. It would go a small part of the way, but it could never bridge the gap. Corporations are of course owned by pension schemes, that is by us. There is a solution, all of us paying more tax. We are after all the place where the blame should lie. We wanted less immigration, we wanted to pay less tax. We have made our bed of nails. The trouble is that it is others who have to sleep in it. Simon Jenkins rightly argues for our church buildings to be used for the broader benefit of local communities. The buildings could continue to to have part set aside for worship. However, he also suggests that they should come into public ownership, possibly paid for by local taxation. I ask him to pause for thought. I spent some twenty years working for the church, or do I mean Church, in one way or another. I got to know its organisation at local, diocesan and national levels. I met very many people who were striving to keep the Church, or do I mean church, going? 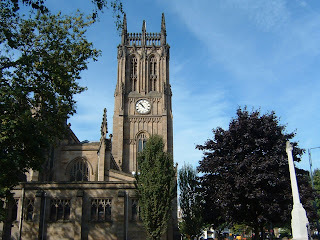 I found, over the years, many instances where church buildings were being used by local communities for concerts and plays. I found some in use as meeting places. I know of one certainly in use as the village post office. Medieval churches are now generally sound buildings, but not always warm or dry. Adaption is often needed and that costs money. I say that the structures are generally sound and that is true for now because of the efforts made by congregations and dioceses aided by English Heritage and Lottery funding amongst others. It is only true for now, since maintenance has to be on going. There is thus a significant cost attached to open and indeed closed churches, as Jenkins recognises. A key question is how to pay. In villages, my experience is that voluntary groups of Friends are very successful in attracting financial support from villagers who never go near the church for worship; it is their church. To interfere with this, by imposing local authority ownership or control, would I am sure be a strong disincentive. People like to give, but are not so keen on being taxed. Just witness the outcry caused by chancel repair liabilities. The model that I have found works well in many size and type of community, but not everywhere. Simon Jenkins is right to re-ignite this debate. At the very least we need to consider having an imperative placed on Dioceses to enable community use of church buildings. I could not help comparing the courage of Churchill and the nation in facing up to an enemy from the east with the weak responses to Euro blackmail in the Brexit negotiations. Whilst watching the film the thought occurred to me: what would Churchill be doing now. As another friend said when I mentioned it to him, the choice of precedents from a career of more than sixty years is enormous; you can almost take your pick. So, I pondered further. In the Second World War Churchill was the arch populist, but that had not always been the case. Up until Dunkirk I would say that public opinion favoured Chamberlain and his efforts to secure peace. The memory of the carnage of the trenches was far too vivid for any sane person to want war. I suspect that very few favoured Hitler, although some wealthy people and others holding right wing views probably did. So, I think that Churchill was in a very lonely place seeing that something wholly undesirable was inevitable. In order to swing the argument in his favour, he employed undeniably populist techniques by his brilliant use of simple language and imagery. He continued to do this until the war was finally won. In peacetime, he was strongly in favour of a union of European nations. He did not favour the United Kingdom being a part, but, I suspect, because he was still much wedded to Empire. I truly don't know what he would have done now. He was not a successful peacetime Prime Minister and so not the first choice as a negotiator. He might have toughed up to the Commission. However, certainly in his later years there is evidence that he would look for a roundabout route to securing his aims. It would have involved his oratory skills, but also his nose for the unexpected route through a problem. So, I say to my friend, we would probably benefit from him now, not to tough up but to have a little vision on our route and destination. I was lucky enough to be a student during the banking crisis which meant I had time to read about it, research it and indeed to write about it. I remember my anger at reckless and greedy bankers. I remember too the calm reflection that pointed the finger at me, at us. Bankers may have been reckless and greedy, but we, as members of pension schemes, wanted our pensions. If we had savings, we wanted a return. The reality though was that high returns were a thing of the past. Chinese surpluses had provided all the cash the western world needed and interest rates could be rock bottom. It didn't matter. We have now lived through ten years of rock bottom interest rates. From time to time amazing investments appear, only to disappear. Ironically for British investors Brexit provided a shot in the arm: a weaker pound meant that the non sterling earnings of global British companies were worth more overnight. Returns have been good and will remain so, unless we decide to invest in the UK economy which, what any one says, is suffering. The NHS needs billions more just to stand still. University lecturers want decent pensions; actually everybody does. The reality is that the investment returns simply aren't there to provide them. We are desperately short of housing, yet houses have never been more valuable. Government outsourcing was meant to be a panacea. Now outsourcing companies are losing money and going bust. Labour wants to take over banking so that banks lend to businesses rather than providing mortgages on over priced residential property or providing ever increasing credit card debt. This is laudable but it ignores what banks have become. They are global. They make a good slice of their money from trading currency and securities and this profit provides much needed tax revenue. There is no longer the bank manager in his sober grey suit. The world has moved on. Any government seeking to address the economic issues facing this country needs to take the country as it is, not as it was in the 1950s. It needs to recognise that it can only effect change if it works with like minded governments of like minded nations. It can do nothing alone. The scene of the 'march of shock' following the referendum result.